1) Choose a character you love and would like to see as a leading character in a movie. 2) Don't choose leading characters or supporting characters with lots of screen time. 3) You can use TV characters. 4) Include the logo and link back to Sati's post. I don't think I ever typed a review up for this movie. I had a hard time putting into words my feelings on it. And even now I'd struggle with it (though later I'll tell you it's primarily disappointment I felt). Thankfully this post is irrelevant to my feelings on the film itself. 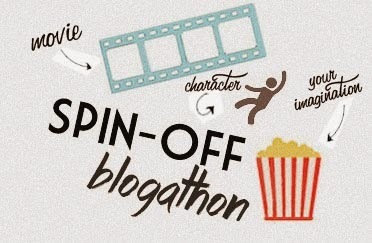 So, my choice for the blogathon is a character that isn't even given a name in the movie. IMDB credits him as "Foreman." It's amusing because the character was placed on a poster to promote the movie. Though he had only mere moments of screen time, through the power of a blogathon I can give him a movie. So, without further ado, I give you Foreman. 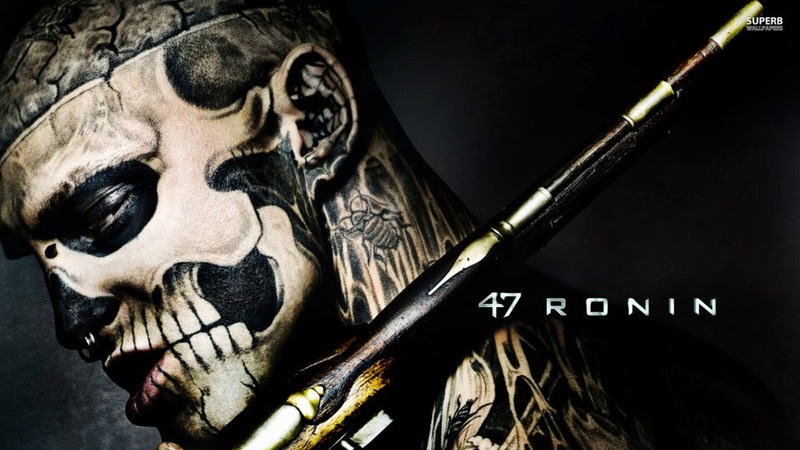 Rick Genest, the actor portraying our Foreman, was tragically underutilized in 47 Ronin. 47 Ronin had its issues - mainly it was super slow and super long (and part of my feeling that way is due to the crazy promotion of this movie as an action flick... it wasn't). As such, to go into Foreman's story, we need a spin-off (because good additions or no, we really don't want to add more running time to 47 Ronin). 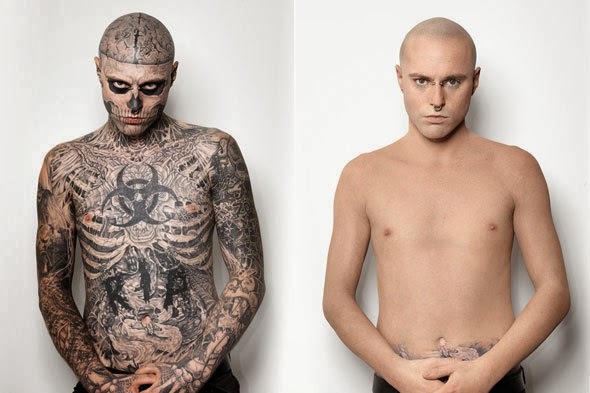 And what makes a Rick Genest character an interesting character? Well, look at him. The tattoos are real. The man is covered, head to toe, in anatomical tattoos (picture below is an advertisement he did for some sort of cover-up product). My story for him, within the world of 47 Ronin, would be an origin story and would entail the gaining of the tattoos (which of coarse isn't simply sitting in a tattooing chair for lord knows how many hours). He starts off as a young man, and through tragedy is forced to become a hardened criminal seeking revenge (I'm a sucker for a good revenge flick). Only through an ancient curse (because they're always ancient) it turns out that any death he is responsible for gets painfully represented on his skin - forcing him to carry around his sins for all to see. His revenge is sweet, but leaves his body permanently "disfigured" (I know, that's not the right word. The man did this to himself as an expression, an art form, and is not a disfigurement. But this is a movie we're talking about). We end with where he begins in 47 Ronin. I went into 47 Ronin expecting an action flick, expecting Genest to hunt down Keanu and company after his escape from the docks. We got little action and Genest's role must be sitting on the editing room floor somewhere. At least now he has some backstory in my head and on this page (vague as I typed it). Since I never did review 47 Ronin, I think you get a sense of the let-down I felt based on what I've said so far. It wasn't awful - once you move beyond the hope of action and accept you are watching a drawn-out (not nearly as effective) love story a la Crouching Tiger, Hidden Dragon (which was excellent). If you haven't seen it, chances are there are better things you could be watching. If you feel you NEED to see it, just expect a slow burn of a movie and maybe you'll be less disappointed. Really cool idea for a movie here! I only saw this guy in this Lady Gaga video he did but he is interesting for sure, shame he was wasted in the film, although judging from the reviews this one got maybe he dodged the bullet, at least no one can blame him if his part was small. Yes, now that you mention it, I do remember the Gaga video. Born This Way. Maybe the reviews wouldn't have been so poor if they promoted the movie for what it was. The TV spots, etc. focused way too much on the dragon and fighting when that's a very small part of what the movie was. Oh well. This was fun and had it not been midnight when I was working on this, I may have fleshed it out some more. Thanks for setting up the blogathan and stopping by. That sounds like a pretty awesome movie! I never saw 47 Ronin, but I'd watch that. Just noticed you did one. Going to pop over there now! This guy is so cool looking. Mind you I wouldn't get tatted like this. I knew exactly who he was though the moment I saw the trailer. I would tell people that is what he really looks like. No one believes me till they google it. After reading your post here too I am sad to read that he wasn't in the film very long. It could've been great what that type of film could've done with this look. 47 Ronin is on hold at the library right now for me. If you insist on watching the movie, just go in knowing it is a VERY slow sorta love story. Nice choice here, man. I haven't seen 47 Ronin yet but I'm intrigued by this character already. I'll also keep in mind that the film isn't an action movie. It would seem that so many have been disappointed due to its marketing. I'm actually surprised I'm not getting any comments from anyone who has seen the movie. I can't be the only one who was suckered into thinking they were seeing an intense action movie. Not that the movie isn't worth seeing, but maybe it's something I'd rather have gotten from one of those boxes that are red.